Ava Wyatt and the German program at DHS have been declared a PASCH school by the German Consulate General and German Central Agency for Schools Abroad. Only seven schools were recognized this year and Dalton High was the only one outside of metro Atlanta. PASCH—which translates to "Schools: Partners for the Future"—is a network of over 1,500 worldwide schools that place an emphasis on the German language. 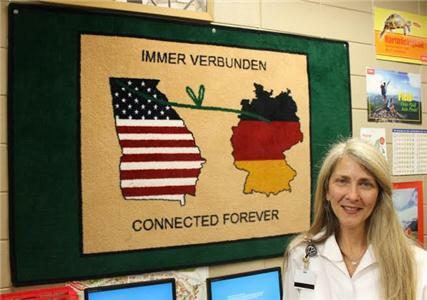 Wyatt was invited to a dinner held in Atlanta that featured other German teachers from the state and area. They spoke of the program and the exam that would follow being accepted to PASCH. Ms. Wyatt and her students also had a visitor— Petra Reuter, a German language advisor for the Central Agency for Schools Abroad. Ms. Reuter came and visited with the students and Wyatt and got a taste of the program. Ms. Wyatt then heard that they had been selected for PASCH. Getting the PASCH award is a big accomplishment for DHS—students enrolled in German classes may now take a test to see if they can go study abroad in Germany for free. Students have to score high enough on the test to qualify for the prestigious experience. Students at DHS will be taking the test next March to see who qualifies to go abroad. Students will also receive a certificate that can also come in handy when looking for jobs. “It tells employers upfront that they can function in Germany,” Ms. Wyatt said. The PASCH Awards were held at Goethe-Zentrum (German Cultural Center) in Atlanta. Ms. Wyatt was not able to attend, but DPS Superintendent Dr. Jim Hawkins went and accepted the award. Ms. Wyatt and 13 of her students headed out for Wernigerode, Germany on May 25 and will be gone for three weeks. In October, German students will be making the trip to Dalton as the other part of the student exchange program.